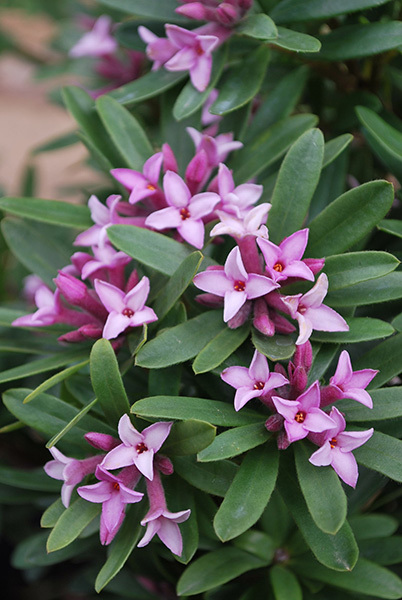 Daphne ‘Spring Pink Eternal Fragrance’ comes from more than thirty years of research and development by renowned plant breeder, Robin White (UK). It not only produces tight clusters at the tips of green foliage in a strong flush of pink in Spring, it also continues to spot flower throughout the warmer months, but with less intensity in colour. ‘Spring Pink Eternal Fragrance’ has an exquisite fragrance as Daphne lovers will be familiar with from the common Daphne odora species. 'Spring Pink Eternal Fragrance' is frost hardy, and both heat and dry tolerant. This Daphne performs in sunny sites without scorching. 'Eternal Fragrance' is also tolerant of both alkaline and acidic soils, unlike other Daphnes which are traditionally pH sensitive. 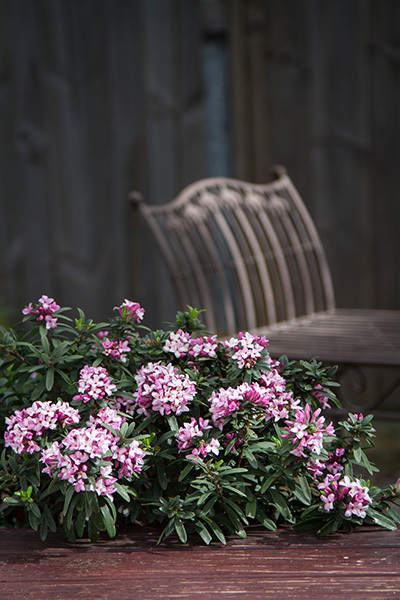 'Spring Pink Eternal Fragrance' is a colour break from the original, award winning Daphne 'Eternal Fragrance', and is sure to be popular by gardeners across the globe. Requires a sunny to a lightly shaded site in most soil types as long as it is well draining. Daphnes do not like to 'sit' in water which encourages root rot. Best grown in moist, fertile soils. For optimum results, lightly prune and feed in summer with a slow release fertiliser to maintain shape and vigour. Will tolerate both slightly alkaline to acid soils making this a truly unique daphne variety for the Australian environment. As the variety is semi-deciduous, the evergreen foliage may incur some leaf drop when subjected to very low temperatures but once the warmer weather arrives will flush with new foliage, covering any unsightliness. Conversely it has survived temperatures of up to 40°C in trials in Australia.